DJ Jukebox is an essential tool for managing a song library and generating playlists. You can rate each song so that favorites are played more often, and that unwanted songs are never chosen. File management features include global search and replace on filenames, copy or delete files, and rename/move directories. DJ Jukebox can remote control a media player on a network computer. A click of the mouse can send keystrokes, playing instructions, and volume changes to the server’s media player. It also supports all media players and file types, commercials, repetition prevention, and much more! Playlist Generator. 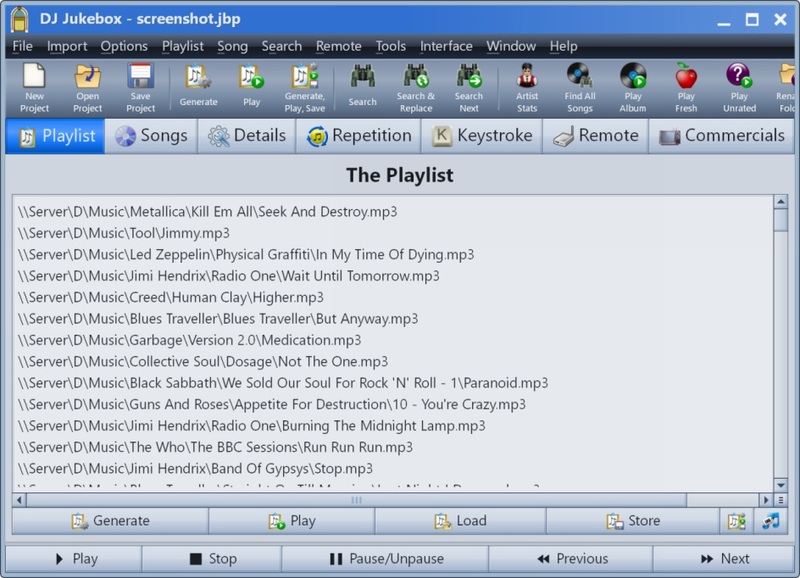 DJ Jukebox generates random lists of songs which can be delivered to a media player such as Winamp. Each song can be rated (on a scale of 0-100) to ensure that favorites are chosen more often. A rating of 0 will prevent the song from being played altogether. DJ Jukebox maintains a list of each song and its rating in the “Song Table”. From this table, songs can be easily renamed, deleted, or rated. DJ Jukebox can also perform a text search and replace operation on the Song Table. Again, the song files are automatically renamed when a change is made. DJ Jukebox can listen for commands from another copy of DJ Jukebox located on a local area network (LAN). Programmable keystrokes can be sent to the server with the click of a button, providing complete remote control over the media player. The remote control feature can be used by a dedicated entertainment server. DJ Jukebox can start automatically during bootup and begin listening for remote commands. The server does not even need a monitor. DJ Jukebox can insert commercials in between songs. The commercials can be any type of media file that the media player supports. The average number of commercials per song can be adjusted, and individual commercials can be assigned a frequency rating that determines how often they are chosen. When DJ Jukebox generates a playlist, it can make sure that songs do not get repeated too often. It can also ensure that no two consecutive songs are from the same album or artist, or have the same name. All songs on the hard drive can be added to the Song Table in one simple step. A song’s meta tags (a.k.a. ID3 tags) can be viewed and edited. Songs that were not recorded properly can be marked as “bad”. This prevents the song from being chosen for a playlist without removing it from the Song Table. The songs can be located on a network computer (no drive mapping is required). Playlists can be saved for later retrieval, like an “Oldies” mix for when you’re feeling nostalgic. A generated playlist can be limited to a single artist of your choosing. You can also choose to play a single album or songs from a single decade. The song list, ratings, and other settings are stored in a “Project” file. 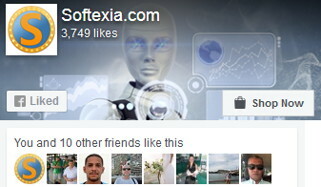 Most users will only work with a single project, but any number can be used. The Song Table can be checked for errors, such as a nonexistent file or illegal rating. Identical songs can be identified and deleted. If you have a separate entertainment server, it can be shut down remotely. If the server supports the Wake On LAN feature, it can be powered up remotely. Command line parameters can be used to generate and play playlists. This is especially useful for creating Desktop shortcuts. The complete list of artists, albums, and songs can be printed. Added the “Convert To MP3” tool, which converts FLAC and WAV files to MP3’s. Added the “Generate From Year” tool. Edit Stored Playlist: this window now allows you to create, rename, and delete playlists. Added the “mp3enc.exe” command-line utility, which converts FLAC and WAV files to MP3’s. Add Selections To Stored Playlist: this window now allows you to create and delete stored playlists. Select Certain Songs: added the ability to select by filename extension. Song Table Statistics: this now reports the total count of each file type. Top 25: added a report of the top artists by number of picks. Added the “Show ‘Bad’ Column” option to the Options menu. This allows you to hide the Song Table’s “Bad” column. Most windows now calculate their width as a factor of the interface font size. Previously they were a factor of the screen size. This ensures that windows are the optimal size, even when the font is very small or very large relative to the screen. Song Table: when moving vertically from one cell to another, the caret will now try to maintain its horizontal position within the cell. The toolbar can now have more than one row of tools. Added the Ctrl+F9 hotkey, which will generate a new playlist and append it to the existing playlist. Auto-Start: added a new Action: Shuffle & Play. Test Server: if the test fails, there is now a “Retry” button. Playlist: added a context-menu button to the bottom right. Edit Stored Playlist: double clicking on the splitter will now set it to the optimal position. Volume Affects Device: it is now possible to clear the selection, which ensures that the project will never report that it has changed because an audio device has been installed or uninstalled. The WOL Password field now displays the password as asterisks. Each user that logs into the system now has a separate set of preferences and global settings. Rip CD: FreeDB: slashes in the song filename are now replaced with a dash instead of a space. Rip CD: the MP3 encoder now defaults to CBR instead of VBR. Test Server: there is now a success/failure banner running across the top. Edit Tags: the “Analyze” tool is now much faster. The /? command line switch will now display the help file chapter on the command line. The Customize Toolbar window now remembers preferences such as its position and the table column widths. Fixed: Search Song Table: under certain conditions, changes to the Song Table were not being applied to the Playlist and Stored Playlists.